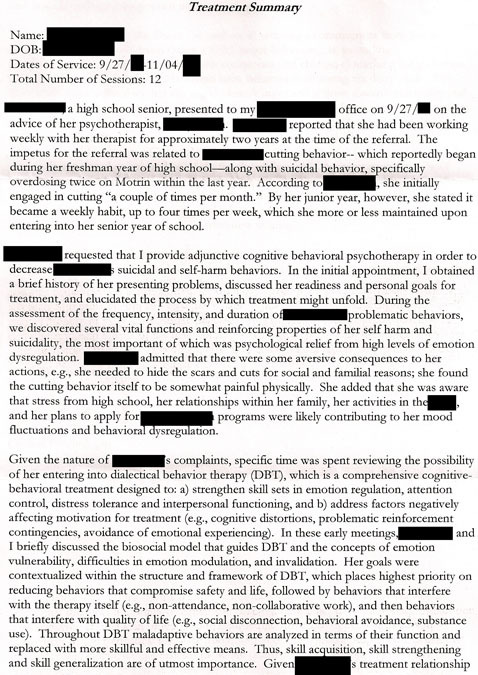 Posted on March 6, 2011 by talesofacrazypsychmajor Tagged attachment problemsattachment theoryavoidantmental healthpsychotherapyschizoidtherapisttherapy	Comments26 Comments on Why do I go through so many therapists? Why do I go through so many therapists? It doesn’t take long of reading this blog for someone to notice that I’ve met with a lot of therapists. I’ve made reference to reasons why I think this is the case, but never organized all those thoughts together. This is certainly something where if I fully understood it that maybe it would no longer be a problem, but I’ll share with you my current understanding of it. Looking at the whole picture, it’s obvious to me that I have an avoidant attachment style. That’s the common thread running through this. I should be clear though that an avoidant attachment style is not the same thing as avoidant personality disorder. Some have tried to suggest I have this, but I really don’t think it describes me well. My problem is with intimacy in particular. There are a lot of things aside from intimacy, which I find anxiety provoking, but I tend to push through that anxiety and continue to do those things. I find close relationships threatening. People who are too friendly feel to me like their friendliness is an assault. I feel like these people like me more than I like them and that they won’t give me the space I need. To clarify I am referring to primarily to platonic relationships here. My concern about them not respecting my need for space it probably partially a projection about my relationship with my mother, but it’s also been further reinforced by others who couldn’t take a hint to back off. My mom has very little respect for interpersonal boundaries. I’m an introvert and she’s more extroverted. She’s the very needy kind of extrovert, the kind who can’t fathom that other people might feel drained by interactions while she feels energized by them. My dad would step in sometimes and tell her to give me some space. She’d agree to do that, but 5 minutes later she’d be back to the same thing. I’d have to physically hide places (like closets) to escape her destructive consuming affection. For her expressing love is not a two person interaction. It is about her and her insecurities. There is a general consensus among my family that she has some type of undiagnosed learning disability that impairs her ability to recognize that she is doing something interpersonally destructive. Now a days I can just hang up the phone on her. I know that sounds awful. But calmly telling her to give me space does not work. And after I hang up I have to turn off the phone because she will call over and over. My email inbox gets flooded with one line messages. A couple of years ago I was staying with my parents for a bit. My mom had bought a new computer, which I set up for her. She’s very computer illiterate. She spent a day pestering me with questions about it (very basic things like installing word). I helped at first, but finally told her to use the Apple support number, since we’d paid for it already. The Applecare person was less tolerant than I was and actually hung up on her. I wanted just a couple of uninterrupted hours to myself after playing tech support all day, so I locked myself in a room. I barricaded the door, because locks in that house are easy to pick. My plan didn’t work out as well as I’d hoped. Within about 5 minutes my mom was banging on the door demanding I open it. It’s important to note that there was no reason she needed to be in this room. If I hadn’t been in there she’d not have wanted to get in. She quickly escalated to threats that she was going to kill me and alternated between death threats and threats of calling the police. I don’t really think she would kill me, but in the moment I wasn’t about to open the door for someone threatening to kill me, even if they were not serious. And if the police had come I think they’d have understood why I’d not opened the door. And what crime could I be charged with for locking myself in a room in the house I lived in? I was having a panic attack and wanted to escape out a window, but I was in my pajamas and had no shoes. My dad was on a business trip and called demanding that I open the door. It turned out that he was simultaneously telling my mom that if she called the police he would divorce her. He was on no ones side. Eventually I was bullied by my dad into opening the door. Thankfully the next day was the day I was scheduled to move into my apartment. That got a bit sidetracked, but I think it illustrates a reason why I find close relationships threatening. My mom’s affection is very aggressive. I’ve never felt unloved and my parents do care about me, but the way my mom shows this is very overwhelming. The problem with looking at my therapy problem as an attachment problem only, is that when I look back at each therapist I’ve left individually I can think of good reasons why I left each. Globally there’s a picture of attachment style that emerges, but individually it looks different. There’s also the issue of how I’ve been treated in prior therapy, which puts me very on guard about protecting myself from bad therapy. It wasn’t until therapist #4 that I actually started using therapy for myself. Before it was something that I was forced into by my parents. I started seeing her because my parents felt I didn’t have enough insight about my ADD. The therapy eventually evolved into a place where I talked more about anxiety and depression, but it took nearly 2 years of more superficial conversation to get to that. The therapy was helpful in some ways, but I hit a point where I reached the limit of how much she could help. She became very pushy about some things. 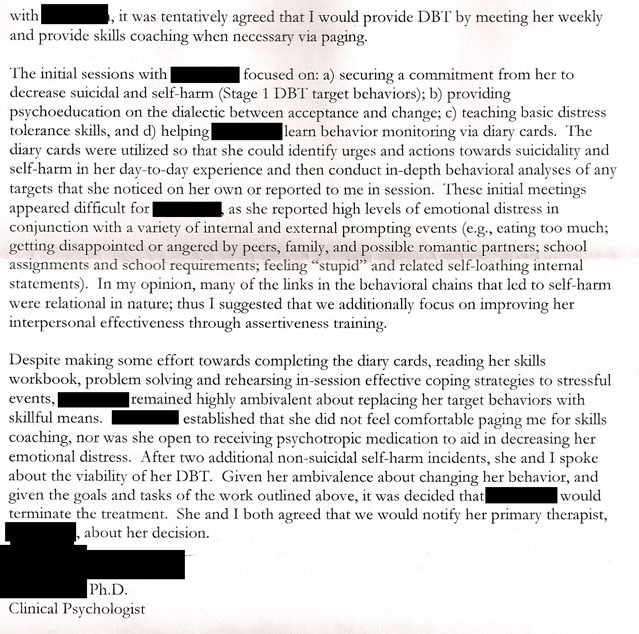 I agreed to start seeing #5 for DBT in addition to seeing her, but that didn’t work out when he demanded I phone him before I self injure if I wanted to meet with him. The theme between the two of them was that I received ultimatums where I either had to do something they wanted or I could no longer meet with them. After I quit DBT, #4 gave me a list of things to pick from. I had to do one or she would no longer meet with me. I picked that I would have my primary care doctor look at my cuts regularly. I felt very bullied by this. I did leave for a little bit and met with #6. #6 was so much worse that I came running back. The final straw with #4 was when she told me she wanted me to do DBT all summer instead of the summer job I’d just been hired for. I went to the job instead and am very glad that I did, because it was a wonderful experience. In a way my tendency to leave therapists easily, is a protection against this sort of bullying. If a therapist tries to threaten that I should do something or else leave, well then I’ll just leave. I’m sick of being pushed around. Threatening to withhold therapy is not a useful form of treatment. An unintentional outcome of these experiences is that I’ve become a lot more assertive in my daily life. I will stand up for myself. Then there was #7 who got me kicked out of my school and #8 who I met for medication who told the doctors at my first hospitalizations to lie to me about my diagnosis. This whole experience made everything more difficult. Not only could therapy be something that might not help, but it also became something that could potentially destroy my career and life goals. While a therapist might believe their intentions are pure, ultimately I am the only one who can protect myself and I need to be on guard to make sure the helpers don’t hurt me. I’ll skip #9 and #10 mostly because that therapy was for the purpose of getting a note to allow my re-admittance to school. Then there’s #11. S.M. My favorite one. He’s the only one I left on good terms with. There’s some idealization going on in there. I’ve tried to hide it from him, but by now he knows. I don’t like anyone seeing if I care at all about them. I’m so used to feeling horrified by overwhelming expressions of affection, that I forget sometimes that in moderation people actually do appreciate being told they’re valued and needed. While I would feel threatened by being needed interpersonally (needed in a professional sense is fine) most people don’t feel like that. I left because I transfered schools and the new one is far away. At the time I didn’t think finding a new therapist would be a big deal. I thought that all psychodynamic therapists were the same (I sure was wrong about that) and that all I needed was another psychodynamic therapist. If I’d realized how much trouble I’d have finding someone else I would have put more effort into finding a school in that area. I do think though that there are ways in which I’ve grown, through this struggle that I might not have had I stayed with S.M. the past 3 years. My idealization of S.M probably made sticking with a therapist harder. I thought for awhile that maybe these other therapists who didn’t work out were just the wrong kind of psychodynamic. I now realize that there is a huge amount of heterogeneity within any theoretical orientation. While I like the psychdynamic approach, it was probably things outside of the theory that made therapy with S.M. work. Things are going okay right now with #27. I’ll wait and see what happens. All of the factors mentioned here probably contribute to some of the difficulty I’ve had in finding a therapist. Explaining partially why I’ve seen 16 therapists in the past 3 years. There are probably others reasons I am not yet aware of. I know that because I’ve personally had so much trouble, that I am the common factor in this. It’s at least partially my own fault. There are certainly elements (systemic and therapist factors) outside of myself that also contribute as well. Even though it seems that with each therapist I see they become a little more disposable, it is still devastating to me each time I leave one. That one or two hours a week is very important to me. This importance is part of why I need so badly to be sure I’m in a therapy that is getting it right. If therapy didn’t matter I’d just be content in something mediocre.